Director: James Isaac / Writer: Todd Farmer / Cast: Lexa Doig, Lisa Ryder, Chuck Campbell, Peter Mensah, Kane Hodder, Jonathan Potts, Melyssa Ade, Derwin Jordan, Melody Johnson, Kristi Angus, Dov Tiefenbach, Phillip Williams, David Cronenberg. Cinema’s apex-predator returned after an eight year absence (nine, if you count the delay in releasing the film) and renaissance of the genre he ruled throughout the 1980s. Evidently, the ‘final’ trick used (for the second time) in Jason Goes To Hell cannot be believed again and thus here comes the dumbest hack n’ slash film to emerge in thirty years! 455 years later, intergalactic explorers happen upon the site and take both Jason and Rowan back to their ship. Led by Professor Lowe, who is keen to benefit financially from Jason’s fame, there’s a healthy number of nubile teenage ‘students’ along for the ride. Rowan is brought out of stasis by the crew, who believe Jason is beyond saving and before she can convince them to dump his body into outer space, he’s up and hewing his way through the crew. With evident debts to Alien, Jason X smartly goes down the comedic route, making the most of the Scream crowd’s awareness and playing up to the cliches. Meanwhile, cartoon-level violence sees a face cryogenically frozen and then shattered on a table, people chopped in half, impaled on giant screws plus the usual throat cuttings, impalings and decaps. The onboard military personnel all fail to survive (let alone stop Jason) and so it’s down to the other crew members, who call upon droid Kay-Em 14 to do some damage and she takes him on Buffy style, eventually blowing him into several pieces. The damage sustained by the ship inadvertently releases the regenerative ‘bugs’ that repair injuries and rebuild Jason with synthetic extra parts. Yes – it’s Super-Jason! Weird to think back to the sack-headead B-movie axe-murderer from 1981. Uber-Jay proves more of a match for the dwindling crew members than his previous incarnation and things go from silly to ridiculous in the final few minutes, but it is punctuated by the film’s best scene, where Kay-Em ‘builds’ a virtual reality around Jason of Camp Crystal Lake in 1980, complete with chirping cicadas, the gentle lake, a full moon and a couple of easy campers (see Dire-logue) and a recreation of Kane Hodder’s favourite kill from Friday VII. 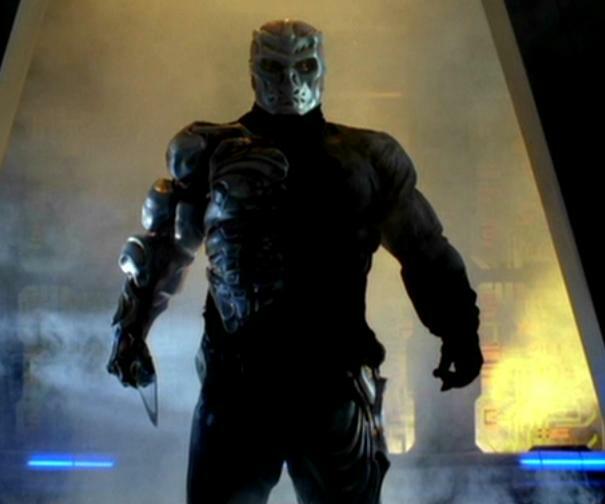 Jason X is a real contender for the “least good” entry in the series (I don’t say worst as I like all 12 films). It’s a step too far down Cheesy Street; Freddy vs. Jason may have been equally as daft but made up for it with some nostalgic setpieces and a respect for the roots of the series that are (the a fore mentioned scene aside) all but absent here. This opinion was accentuated by virtue of the fact that it’s also the poorest performing Friday film so far, barely breaking even; the producers later admitted that they chose the wrong script. In this sense, the 2009 ‘reboot‘ is helpful, the origins having been re-set, rumours of that sought-after Crystal Lake in the snow scenario becoming a reality and back-to-basics stalking and slashing instead of gimmicks and in-jokes. Blurbs-of-interest: Sean S. Cunningham produced; his son, Noel, co-produced and was one of the campfire kids in the original 1980 film. James Isaac also directed The Horror Show (a.k.a. House III); Todd Farmer later wrote My Bloody Valentine 3D and the 2012 Halloween III. Harry Manfredini once again contributed the score. This was Kane Hodder’s fourth and final turn as Jason. Interesting!..I stumbled across this while writing & drawing a cartoon of Jason…your blog makes me wanna’ see it! Coool!!! Send me the cartoon and I’ll upload it! 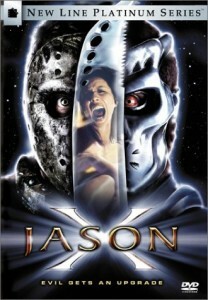 Though this is probably the least recommendable Jason film of the lot! You missed the space station Jason made blow up. So add hundreds to the death toll. Indeed I did – but I don’t think we’ll ever know how many hundreds to add!